Sutton Village Hall is located in the village of Sutton, West Sussex. It is a charity run for the benefit of residents of the villages of Sutton, Bignor, Barlavington and Coates. There are regular community events in the hall, a film society and weekly classes. It is available for hire for private events. Email: suttonvillagehall@gmail.com if you would like to come to any events at the Hall, we would love to see you. 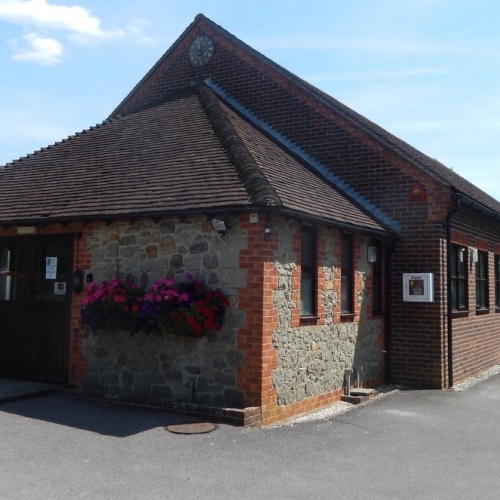 The Village Hall is modern and bright with full central heating. It is fully equipped for functions with a good kitchen, tables and seating for 100+, and all necessary crockery and glasses. It is opposite the White Horse Pub, www.whitehorse-sutton.co.uk , which offers accommodation. Overall Capacity 120; Seating Capacity 100. The hall is licencensed for the sale of alcohol and entertainment including music and films. There is car parking for 20 cars and ample parking on the street. Weekends and bank holidays 8am – 6pm. Reduced rates for residents of Sutton, Bignor, Barlavington and Coates. Film Society – see details here.